Home / About Natural Green / Why Use Natural Green? 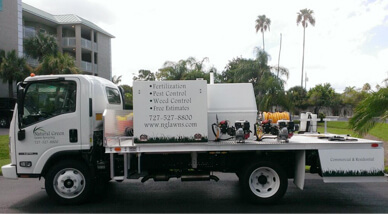 Why Use a Professional Lawn Care Service? You may have been caring for your lawn for years or you may have just moved into your first home with an outdoor space and wonder why you need a professional lawn care service. You may believe that you can give your lawn all of the care it needs, believing that regular mowing and trimming is all that is required most of the time. Never underestimate the benefits you will enjoy when you hire a professional lawn care service for your property. Many other services besides mowing and trimming are necessary for a healthy lawn. These services changes throughout the year based on the season or other factors. Lawn care is a complex challenge and varies by the type of grass and other greenery as well as climate, pests and diseases and other factors. Trained professionals have studied these issues and have learned the tasks required to optimize your lawn’s performance and health. When a problem shows up on your lawn, you may have to try multiple solutions to find one that works. Lawn care professionals can quickly determine the issue and provide the solution the first time around. This saves you money in the long run and prevents the problem from becoming more serious. Many homeowners attempt to treat conditions or care for their lawns on their own because they believe it is less expensive than hiring a professional lawn care company. However, they might be surprised to discover that it is actually less expensive to go with the pros. Many times, homeowners try first one product and then another to find one that works the way they want. They may apply it incorrectly or even use more than necessary. All of this leads to more expense as well as a lawn that doesn’t achieve its full potential. With a professional lawn care program in place, you can be assured that your lawn is always looking its best. It will receive the right treatment at the right time for optimal results. Natural Green Lawn Spraying follows a scheduled program so you know when your lawn will be receiving its next treatment. 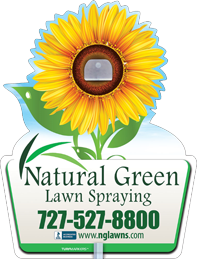 You can trust the professionals at Natural Green Lawn Spraying to provide the best care for your lawn. If you are ready to sign up for our lawn care program or shrub care program or have more questions, you can give us a call at (727) 527-8800.